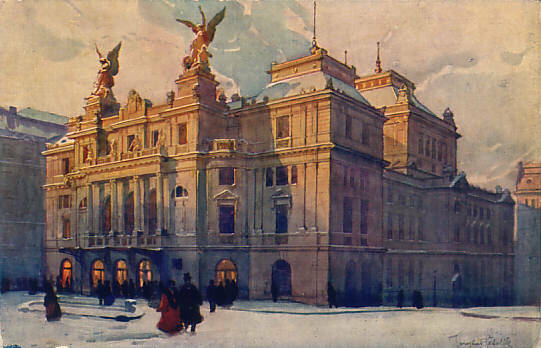 Built 1904-1907 by Alois Censký. 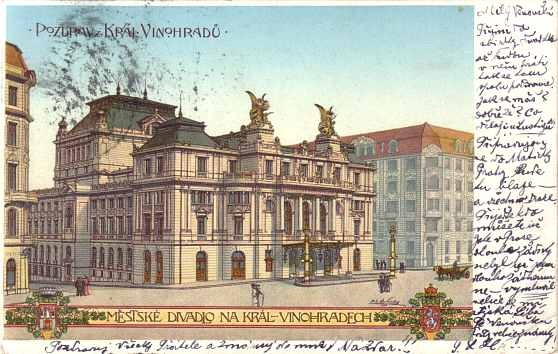 Opened 24 Nov 1907 with Jaroslav Vrchlicky's "Godiva". Used for opera and drama performances by the resident companies. Since 1919, exclusively used for drama performances. Sine 1922, operated by the city of Praha. Closed 1941-1943. 1943 seized by German troops, subsequently used as a movie studio. Since 1945, again used by the resident drama company. 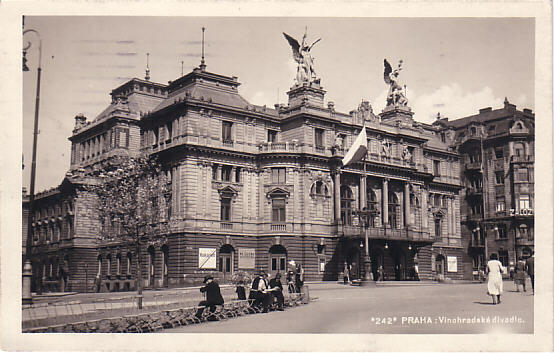 1950-1960 operated by the Czechoslovak Army and renamed "Theatre of the Czechoslovak Army". Since 1960, again operated by the city of Praha. 1965 re-renamed "Divadlo na Vinohradech". Front Text: signed: "Jaroslav Setelik"
Reverse Text: "Stadttheater d. Kgl. Weinberge - Künstlerpostkarte nach d. Aquarell v. J. Setelik"
Front Text: "Praha, Vinohradské divadlo"